We all have felt it before a performance: the jitters, the knocking knees, the slight panic that sets in prior to walking out on stage. Whether with a group or solo, musicians feel nervous before performances to varying degrees, and this is especially true of students. As instructors, directors, and teachers know all too well, some students can pull it together and appear calm, cool, and collected – even at an early age. Others, however, are just the opposite and start sweating, pacing, panicking, and can even experience heart palpitations and shortness of breath because of pre-performance anxiety. 1. You know the importance of practice, but does your student? Seriously, think about it for a minute. Teachers tell students that practicing is important, but do your students realize that with practice, not only will they become better players, but they will also become better musicians and face much less stress before performances? Have you told them that the more they practice, the better they’ll be able to recover if they make a mistake, and the fewer jitters they’ll have beforehand? If they practice enough to almost play it in their sleep, students will feel more confident and less nervous. Encourage students to run through their pieces a few times each day before a performance. 2. Encourage your students to arrive early to the venue whenever there is a performance. The last thing a performer needs is to take on additional stress from running behind schedule on performance day. When your student has time to prepare and can take his or her time tuning and warming up, frazzled nerves will be calmed and jitters can more easily be soothed. Having to rush can cause undue stress on top of a lot of stress that is already present. 3. Many teachers find that teaching their students visualization techniques, which have been proven to help with performance anxiety in many ways, is one of the best ways to help with performance nerves. Professional performers use these techniques in a variety of applications, from public speakers to athletes to musicians. This is a type of meditation that has students visualizing his or her perfect performance. The more details that the student can include in the visualization, the better. They should visualize their breaths, the notes they will play, the audience, and their fingers moving. They can consider visualization as mental rehearsal, which over time can improve performances because the brain won’t tell the difference between the visualization and the real thing. 4. Breathing techniques involve controlled breathing that is a natural, effective way to reduce stress and anxiety. Students can sit in a comfortable position, whatever they may choose. With their chin pointed down as close to the chest as possible, they should close their eyes and inhale to a count of five, then exhale for five. Then, the chin movement should be repeated but this time, the count both times should be extended to 10. Many students find it helpful if they also visualize something positive, like the audience giving them a standing ovation or a peaceful waterfall. 5. Some students may continue to struggle with anxiety on performance day despite trying these techniques. If your student continues to suffer from a level of anxiety that is strong enough to consider further intervention, it may be best to instruct him or her to talk to their doctor. He or she might be able to begin taking a natural supplement, over-the-counter medication, or prescription drug to help, although the risk of side effects from medications may pose additional issues. Your students will be able to overcome their jittery nerves before performances with your guidance, encouragement, and instruction. Mental rehearsals, controlled breathing, making good time, and conscientious preparation are all healthy ways for the student to cope and if all else fails, his or her doctor may be able to assist further; your student will be able to cope with various levels of stress in a variety of settings and circumstances, with your help. 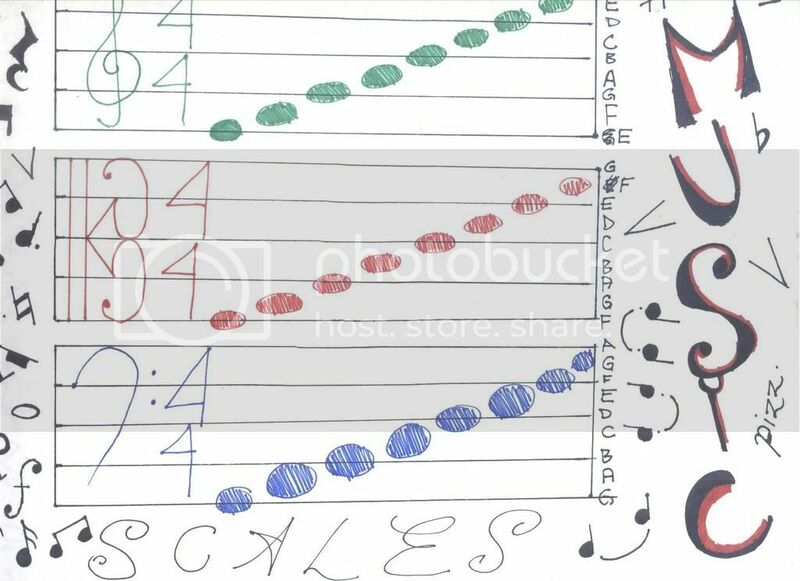 Scales… Ugh! Who loves to learn to play scales? Arguably scales are very helpful to learn skills, pass exams, play faster, etc. Motivating students to practice – using scale sticks for random choice has helped my students want to practice their scales. My earlier blog post ‘Scales Made Easier‘ helps my students to learn scale patterns. However, I have added a fun element to provide a way of preparing students for the randomness of needing to play scales out of order, to sharpen their mind. Introducing wooden sticks has helped students to practice scales in a more fun way (which scale am I playing next, left/right/together etc?). I also use several dice with ‘left hand’, ‘right hand’, ‘hands together’ or ‘hands together with eyes closed’, 1 finger, together contrary motion, etc., for scales or arpeggios. Students pick a stick and roll the dice (for scale, broken chord or arpeggio, depending on what stick they picked). Students enjoy learning interesting facts about the composers of music they like to play and listen to. It can be really exciting for them to learn what is ‘behind the scenes’, motivating them to want to practice more too. As Samantha Coates suggests “It is not your job to motivate students. It is your job to create the environments in which students will motivate themselves.” As part of our students’ theory classes, we have been learning about a Composer of the Month. We have found that group classes offer a great way of motivating students. Students discuss and understand more about the music that they want to learn to play. They are also learning music history at the same time as well as learning some music theory.